THE historic Fettes police building is at risk of being sold after it emerged Police Scotland was looking to get rid of old stations as part of a cost-cutting drive. Stations across the Capital could be at risk of closure under proposals in an “estate strategy” report set to be approved by the Scottish Police Authority today. And one prime candidate for sale is the former Lothian and Borders police headquarters at Fettes. A source said Fettes was an obvious target since its previous role as force headquarters was now redundant and it was a prime site. The former HQ appears to meet the criteria listed for buildings which would be replaced – “property not in the right location, or properties in poor condition that cannot provide for future needs”. The Fettes building, created in 1973, has previously been criticised as “not fit for purpose” and plans in 2007 to upgrade the site were knocked back due to the cost. 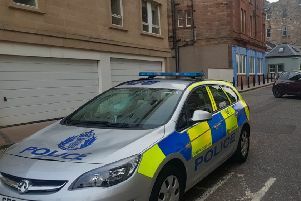 The new Police Scotland estate strategy has proposed to reduce the total floor space of garages, offices and other premises by up to a quarter, with a saving of between £5m and £18m a year. Police Scotland says it inherited the property of the eight former forces and in some cases it no longer meets the demands of 2015 or the needs of communities. There is already concern that Portobello police station is at risk, with speculation the building could be sold to Wetherspoon. The source said West End police station was another large, old building in a key location which the force might be able to dispose of. Leith could fall into the same category. In 2013/14, the Evening News campaigned against cost-saving plans to close a swathe of police station counters in Lothian. Over 18,000 people signed petitions in protest and the police eventually reversed the proposals on three stations, but counters at seven others still shut. City council Tory group leader and former policeman Cameron Rose also voiced concerns about potential closures. A spokesman said extensive consultation would be carried out before any change and the decision would be made by the local police commander. Relocating a police station to shared premises with the local council, as has already happened in Livingston, is a model Police Scotland is keen to purse where possible. The spokesman said alternative provision would be put in place before any closure. Police Scotland Superintendent Gary Ritchie said there were “currently no plans” for any station closures in Edinburgh.